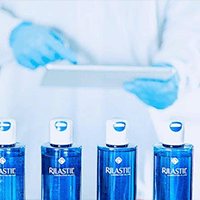 Rilastil Xerolact is a specific dermatological treatment which restores optimal levels of hydration, reintegrates the functionality of the hydrolipidic barrier and the physiological elasticity of dry, very dry, sensitive and xerotic skin. Rilastil Xerolact Balm Sodium Lactate 18% is an emollient and smoothing treatment, specific to contrast localized hyperkeratosis. Formulated for xerosis-prone skin, it reduces the abnormal thickening of the skin, restoring its physiological elasticity. Ideal as daily adjuvant treatment in case of localized hyperkeratosis of the elbows, knees and heels, follicular and plantar hyperkeratosis. INGREDIENTS: Aqua (Water) • Sodium Lactate • Glycerin • Isohexadecane • Isononyl Isononanoate • Cyclopentasiloxane • PEG-30 Dipolyhydroxystearate • Polyglyceryl-2 Dipolyhydroxystearate • Butyrospermum parkii (Shea) Butter • Hydrogenated Castor Oil • Magnesium Sulfate • Tocopheryl Acetate • Zea mays (Corn) Oil • Sodium DNA • Cetyl Dimethicone • PEG-8 • Tocopherol • Ascorbyl Palmitate • Ascorbic Acid • Citric Acid • Phenoxyethanol • Ethylhexylglycerin • Parfum (Fragrance).